Double CD Box. 500 numbered copies. 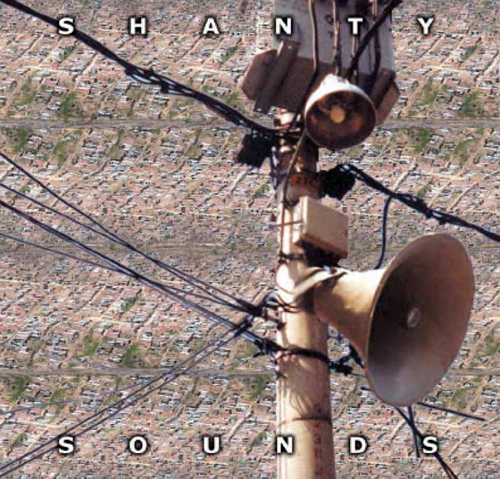 SHANTY SOUNDS are the sounds from Bogota. Of its marginal settlements, that hang incredibly from the hills that surround the capital. All the recordings were made between nov 2002 and feb 2003, in 5 different neighbourhoods of the periphery. They include soundscapes, interviews and casual conversations, as well as the work of two local rap groups. This CD is a commission by The Structure of Survival, 50th Venice Art Biennial, 2003. I produced some songs for two shanty rap groups, Perpetuo and Makube. They were from 16 to 21 years old, and it was the first time for them recording in a professional studio and producing their original beats. Rap is very popular amongst the younger generations in these neighbourhoods. iI has nothing in common with the rap industry in the USA. To rap you don’t need any instruments or technology, just your voice and the lyrics. It sprouts from the resources shortage. It is used as a resistance tool to talk about the violent and inestable situation, and to criticise the oppresive system. Rap can be understood as a historic document, as its lyrics contain personal true life stories that reflect a wider social problematic.